The bathing water is located in a sheltered bay, south facing, and is predominantly sandy in nature with a pebbly foreshore. The beach is backed by the village of Aberdaron, and then agricultural land. The bathing water lies in the Lleyn Peninsula and the Sarnau Special Area of Conservation. To the west is the Glannau Aberdaron Site of Special Scientific Interest and to the east the Wig Bach A'r Glannau I Borth Alwm Site of Special Scientific Interest. The water quality sample point lies opposite the end of the concrete slipway. Natural Resources Wales will work to establish sources of pollution around Aberdaron. Some of this work will be carried out in partnership with Gwynedd Council and Dŵr Cymru Welsh Water. Routinely, inspections are carried out by Natural Resources Wales in partnership with the local authority and the water company. These are carried out pre-season (before the 15th of May) and mid season, if required (during the bathing water season). Investigations will also involve working with the local farming community and land owners. Below the main pumping station there is an emergency overflow, which spills close to the designated sample point. This could have an impact on bathing water quality during periods of high rainfall. Natural Resources Wales has developed a good working relationship with Dŵr Cymru Welsh Water and liaises regularly to identify problems that could affect bathing water quality. The sewage in Aberdaron is pumped from the village to the sewage treatment works. The pumping station is at Henfaes Car Park, near to the mouth of the Daron. Sewage receives secondary treatment and final settlement at the works prior to discharge, which helps protect bathing water quality. Phytoplankton (microscopic algae) naturally increase in number at certain times of the year. This process is known as phytoplankton bloom. Algal Blooms can occur at any beach during the bathing season and are usually noticeable by a surface scum. This beach has no history of such blooms. Streams are typically affected by sewage or industrial run off from further up the catchment. The main stream flowing into Aberdaron is the Daron. The Daron is made up of the Cyll y Felin (from Rhoshirwaen/ Rhydlios) and the Daron itself that drains from the Rhiw area. Both these watercourses have the potential to result in reduced water quality, after heavy rainfall. The sewage treatment works discharges into the River Daron approximately 80 metres before it discharges into the sea, upstream of the bathing water. Storage at the pumping station was increased to reduce spills and the Sewage Treatment Works (STW) has had a new screen and balancing tank. This has now been upgraded to include tertiary ultra-violet disinfection. Natural Resources Wales samplers make visual observations of the beach at every visit. This includes assessments of sewage debris, animal faeces, litter and oil or tar. 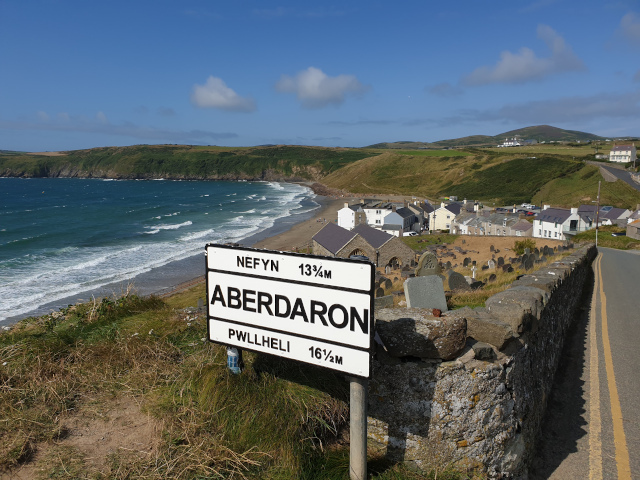 At Aberdaron, data are available for the four year assessment period from 2014-2017. Sewage debris was not observed at this bathing water. Trace amounts of animal faeces were noted at the site on a minority of occasions. Trace amounts of litter were observed at the bathing water between twenty per cent and one third of the time. Oil and tarry residues were not noted at this site. The type of farming in the Daron catchment is mainly mixed beef and sheep, with a few dairy farms. The Cyll y Felin catchment on the eastern side has been identified in WAG surveys as being an area impacted by agriculture. To the west of the beach the Saint (a small stream) runs onto the beach through Porth Simdde. This similarly drains a predominantly agricultural catchment, with some private housing. A number of farms visits were carried out in 2011 to review practices and ensure that they were not adversely affecting bathing water quality as a result of contaminated runoff entering watercourses in the catchment. There is no industry as such in the catchment. Farming is the predominant land use. Approximately 6 farms in the catchment have small caravan sites, mainly discharging to septic tanks. A couple of campsites are particularly large, and are prone to increased visitors during peak periods. The village of Rhoshirwaun is not connected to mains sewerage, but will have septic tanks located near to individual properties. The natural drainage (hydrological) catchment is relatively low lying with large areas of grazing land dominating the landscape behind the bathing water.